I have 4.2.x with 4ccr, I plan to upgrade to a 16 or 24 car, I want to use the new auto sequence feature in SS. At my current basic level I can not. What upgrade do I need? 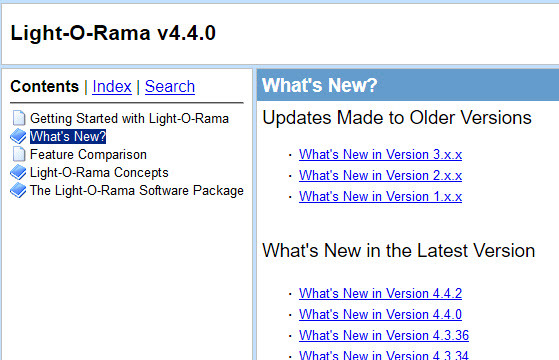 Not sure what version you are asking about but if you go here http://www.lightorama.com/help/ and click the What's new link, you can go through all of the release notes for every version of the LOR Software Suites. Those should tell you what version the new auto sequence feature in SS was added. I believe your link is for the LOR version, Jerry is asking about SS version. Ok, so if I get the 24CCR license, according to Brian, if I stick with 4.2.x, I will need a maintainance license to use the auto sequencer. never heard of a maintenance license. If you upgrade your SS to 24 ccr you can either upgrade your LOR or keep your LOR version and use the SSedit to upgrade your SS to the version with auto sequence which I indicated above. That is what I do since I am happy with my version of LOR. Once you upgrade I can send you a copy of my SSedit and tell you how to install it.